eXode Trance, Techno / House / Trance Sample from PowerFX. PowerFX has announced the release of three distinct Refill titles for Reason software: the "eXode Trance Refill", "Scandinavian Roots Refill" and the "Hip Drums Refill". 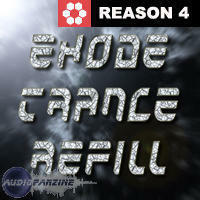 The eXode Trance Refill is the latest offering from Reason guru "eXode", who has previously created an expansion Piano refill for Propellerheads, a soundset in Reason 4 and the popular Mjolnir Refill. The Trance Refill contains over 350 Thor, Combinator, sequence and effects patches with a hard slant towards electronic dance music. The download is for REASON 4 only and is available for $59. The Hip Drums Refill was created from recordings of the Yamaha Hip Gig drumset. These drums have a tight, focused sound which is ideally suited for musical styles Pop, Funk and Rock. The refill includes 252 Rex files and 2 multisampled NN-XT key mapped kit patches in General Midi format. This combination makes the Hip Drums Refill a complete drum production tool and the download is available for $29. Scandinavian Roots opens up a whole new world of sounds and historical instruments from the enchanted lands of the North. With 19 multi-sampled instruments like the Hurdy Gurdy, Kantele, Swedish Bagpipes, Pump Organ and the Offerdahl Pipe and over 980 REX file loops, this is a creative paradise of those looking for acoustic and organic sound sources. Additionally, the refill contains 26 NN-XT patches and 28 Combinator patches and is available for $79. For more information and to hear product demos visit go to the PowerFX website. For more information, visit their web site at www.powerfx.com. Equinox Sounds Chilled Out Grooves Equinox Sounds has released Chilled Out Grooves: "DOWNTEMPO", a downloadable loop collection from it's new content partner, Smash Up The Studio. Spectrasonics Omnisphere is Shipping Spectrasonics has announced that their eagerly awaited Omnisphere Power Synth is now shipping to authorized Spectrasonics dealers worldwide. Voxengo releases Elephant 3.0 Voxengo has released a major version 3 update for their mastering limiter, Elephant.